I recently covered the launch of VMware’s Horizon Suite of End User Computing (EUC) products, including VMware Horizon View, VMware Horizon Mirage, and VMware Horizon Workspace. The products present a set of tools that enable IT to exercise comprehensive end-point management while delivering a unified user experience across a variety of devices and access methods. Today, I want to focus a bit more on View and Mirage. Specifically, when would you choose one solution over the other? Let’s briefly review each product. VMware Horizon View provides a virtual desktop infrastructure (VDI) platform for consolidating PC’s in the datacenter, with secure brokered access using PC-over-IP to those desktops from a variety of devices (user-owned or corporate, PC, Mac, tablets, etc.). 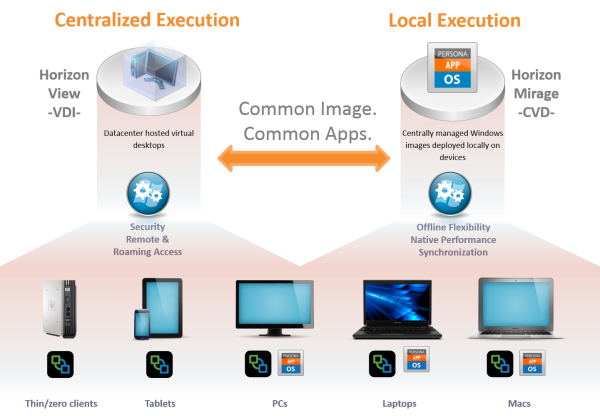 VMware Horizon Mirage, by contrast, is focused on the physical endpoint – laptops, desktops, etc. Mirage introduces end point management capabilities that allow IT to deliver standardized layers to endpoints. The layers on endpoints include the OS layer, driver layer, application layers, machine identity (hostname, SID, Windows license), and user personalization layer. Layers can be pushed to endpoints to manage OS upgrades, application deployments, and hardware changes. At the same time, the layers are being synchronized to a central repository (centralization in Mirage terminology), providing single-instance backup and recovery capabilities for the complete endpoint. Backups include all layers, not just user data, for rapid repair or restoration of a failed PC. These two very different tools are complimentary to each other. Both are part of a holistic approach to managing the corporate PC. Because endpoints requirements are as diverse as the users who work on them, different technologies must be leveraged to deliver the experience expected by users while maintaining the business and security requirements of the desktop computing environment. Some workloads and user experiences are better suited to physical endpoints – a one-size fits all approach with a technology like VDI may be too disruptive to the user and their ability to work. That said, let’s look at some criteria that will help you to decide on which combination of tools to bring to use for your desktop use cases that will enable IT to deliver desktops as a service. Enable Bring Your Own Device (BYOD), allowing users to use their own PC, Mac, tablet or other device to access a corporate PC. Provide access to same single PC computing environment from any device. Enhance security of endpoints by placing desktop within datacenter. Allow users to install applications and customize PC operating environment. While there is overlap in use cases for Horizon View and Horizon Mirage, certain use case goals or requirements will dictate which solution to apply to your user case. With bundled Horizon Suite licensing, you don’t have to choose one or the other. A single license gives you access to both Horizon View and Horizon Mirage for a named user, allowing you to provide the best solution for a particular user’s requirements, and to adapt your desktop deliver approach as your user needs or IT requirements change. Interested in learning more about Mirage, View, or Horizon Workspace? Reach out to us today for a demo and licensing quote.